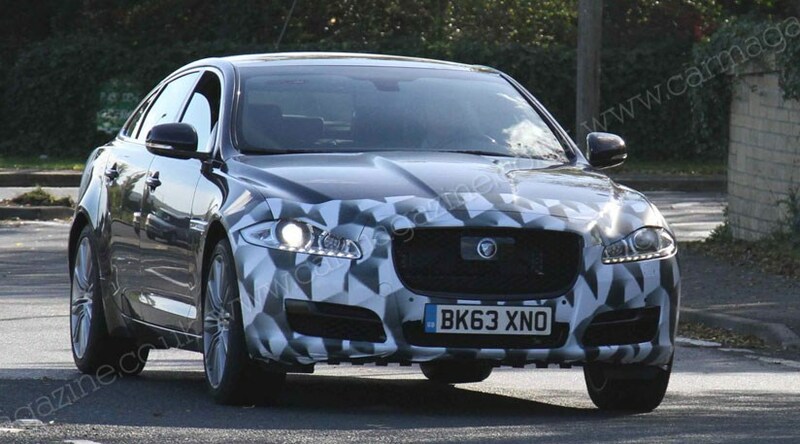 This is the facelifted 2014 Jaguar XJ undergoing test running in the UK – and proving that Ian Callum got his divisive design for the Jaguar flagship right all along. Only the slightest of tweaks to the front and rear bumpers lurk beneath this light camouflage, as the big cat prepares to take on the all-new Mercedes S-class, refreshed Audi A8, and revised Porsche Panamera. Has anything changed for the new Jaguar XJ? The front bumper has adopted a smoother appearance, losing the contours that fed into the lower central air intake. The side intakes are now more rectangular in appearance, and feature reshaped central strakes, like those on the facelifted Jaguar XF. At the rear, the exhaust pipe housing is now wrapped more tightly around the chromed pipes, and the numberplate housing is squared-off. And that, ladies and gentleman, is your lot. No new light clusters, nor any extra chrome brightwork. In the best facelift tradition, it’s been an exercise in ironing out the wrinkles. Is that really going to be enough to fight off the S-class? The only fly in the S-class’s ointment is its staid looks – a claim that could never be laid at the door of the XJ. And while the Jaguar can’t compete with the S-class’s technical features, the Brit has always erred on the side of dynamics, being the big limo you’d chose to drive yourself, rather than be driven in.